America recently condemned Chelsea/Bradley Manning to a life in prison, after years of extrajudicial confinement and torture, for the crime of releasing embarrassing information to the public. Russia is shielding American NSA whistleblower Edward Snowden from similar persecution. American mainstream media are now essentially a propaganda arm for the State. Russian-funded news outlet RT regularly covers crucial stories censored by American mainstream media. America tolerates Barack Obama, a psychopathic con-man who has shown duplicity, destructiveness, greed, and incompetence at nearly every turn. Russia toasts Vladimir Putin, the James Bond of world leaders, a formidable tactician respected by his enemies who compares very favorably against recent US Presidents in political wisdom, skill, and sometimes even something resembling humanity. America is now the evil empire feared by the world, raining death and destruction on every weaker power she does not control. Russia is now the voice of reason in matters of war and peace. Russia is far from a libertarian utopia, and I harbor no plans to move there. Nevertheless, these recent trends are significant and merit examination. The time and date of birth for modern Russia is disputed. This chart is one of two proposed charts for the first raising of the new Russian flag over the Kremlin. It seems to be fairly descriptive of the regime. Pallas: On the authoritarian end of the spectrum, Pallas is widely conjunct Pluto. This moves the needle at least a bit towards authoritarianism. On the libertarian side, however, there's quite a bit: Pallas is also conjunct Mercury, more closely than to Pluto. Jupiter, ruler of Pallas, is trine the North Node and square Mercury. Compared to most sizeable regimes, Russia appears to be relatively benign with a tendency to continue in that direction over time. Venus: Moving Russia to the economic Left is a number of factors. Venus sesquiquadrate the South Node. Mars, co-ruler of Venus, is at the midpoint of Venus and Neptune. Mercury, ruler of the 2nd House, is quincunx the South Node. Because of the relatively decent Pallas placement, however, extreme economic controls are astrologically unlikely. Russia seems to allow her market to function somewhat, and boasts of low unemployment. Moon: The Moon is in the 1st House on this chart, and forms aspects to much of the rest of the chart. This suggests that race and culture are very much in the forefront of the national psyche. The Moon herself is widely trine the North Node, indicating something of a culturally conservative element. The South Node, however, is in Cancer and forms a quincunx with Mercury, ruler of the Moon. Neptune forms a sesquiquadrate aspect with the Moon. The persecution of homosexuality in Russia, recently in the news, is probably a symptom of the cultural clashes indicated here. In the long run, the liberals appear to have an overwhelming advantage on this chart: should the regime live long enough, it may come to resemble the US in terms of cultural liberalism. The Bowl: All the major planets on this chart reside in the lower hemisphere. In contrast to the aggressive Soviet Union, modern Russia seems content to defend her own turf, support her allies, and stay out of the limelight for the most part. The overall picture for this chart: light-Fascist, perhaps, to begin with, moving towards a not very heavy-handed Leftism over time. Again, not exactly a libertarian paradise, but Russia compares favorably in the long term to the USA. It's interesting, then, that Vladimir Putin is currently in charge. His chart, which we may view in the near future, leans quite a bit to the Right. 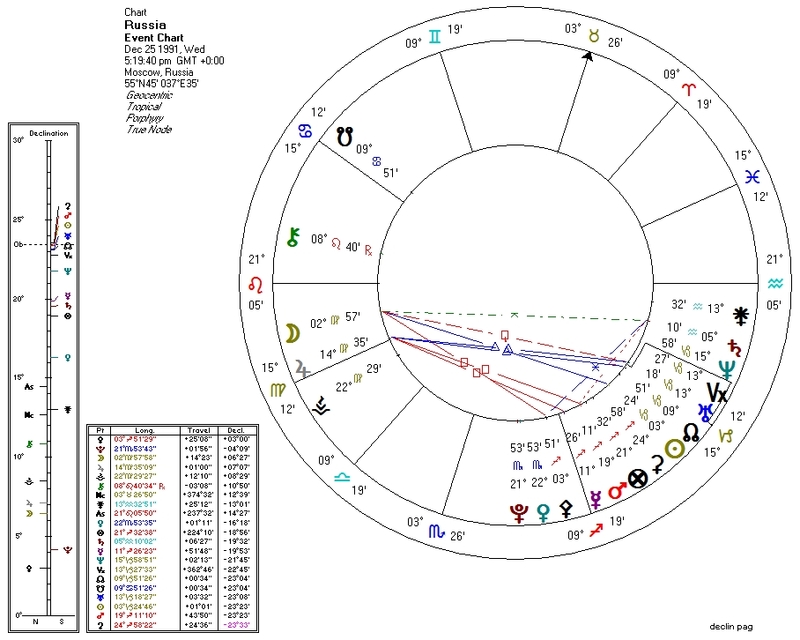 By the way, the South Node is transiting over the MC of this chart, Jupiter is transiting over the South Node of this chart, Pluto is transiting over Uranus of this chart (ruling the Seventh), and Saturn is transiting over Pluto of this chart (ruling the Fourth). This suggests: bad publicity, more bad publicity, power struggles with other nations, and significant land/infrastructure challenges. Clearly the regime should have hired an astrologer before planning to host the Olympics for this year. February 7, 2014 at 2:34 PM http://www.infowars.com/the-truth-about-russias-anti-gay-law/ ...it actually bans certain media aimed at minors but does not actually concern homosexuality per se.